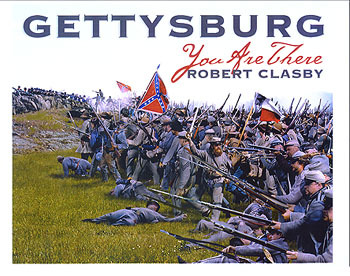 A tour de force of computer-enhanced photography and meticulous research, Gettysburg: You Are There is a photographic recreation of pivotal moments in the Battle of Gettysburg. Modern battlefield photographs, reenactor images, and computer-graphics combine to yield a uniquely realistic, time-machine-like portrayal of Pickett’s Charge, Little Round Top, McPherson’s Ridge and more_close to how they looked in July, 1863. Historic 19-century photographs of the battlefield give a fascinating frame of reference. Clasby also provides a lucid text on the battle’s key events and an Appendix covers “Touring the Battlefield With This Book” and describes the unique graphic techniques used to produce the images. Robert Clasby operates Historic Graphics, Inc., illustrators of militaria. A former professional football player, he was a starting defensive tackle for the NFL’s St. Louis (now Arizona) Cardinals from 1986 to 1990.